Vanessa Daws – Swimming in the Docklands was one of the three successful projects in the first year’s Docklands Arts Fund Small Grants Scheme (2016). Vanessa has been working with the Half Moon Swimming Club, Irish Long Distance Swimming Association, Irish Water Safety, Dublin Port, The IFI, the Ringsend Sports Office, The Dublin Dippers and local rowing and boat clubs in the Dockland’s area. The South Wall Swim is a swim journey around the South Wall in Ringsend. The project aims to explore the lower Liffey, Docklands and the South Wall from a swimmer’s embodied viewpoint. The swim will promote water safety and also highlight water quality in the Liffey. With the many changes happening in the Docklands area, this swim is seen as a celebration of the swimming, rowing and aquatic traditions in Ringsend, and also a way to film and document the harbour and the wall in it’s current state from a unique perspective. A selected group of swimmers will swim the 7km journey starting at St Patrick’s Rowing Club by the East-Link Toll Bridge, around Poolbeg Lighthouse and to the Half Moon Club on the South Wall, connecting the historic water based clubs. The South Wall Swimmers will swim one at a time, one after the other. Each swimmer will chose a time they are happy to swim for, be it 5 minutes or a half hour, when their time is up they swap with the next swimmer, this will be repeated until we reach our destination, this is based loosely on Channel Swimming relay rules. I’m an open water swimmer and my art practice explores place through swimming. ‘Place’ being the watery space that is navigated and swam through, the littoral space surrounding and the social space created by this shared activity. For the Docklands Small Grant Award I’ve been searching for people to swim with and stories of swimming activities in the Docklands area from the Toll Bridge round to the Shelley Banks. I was told that “Most of the children from Ringsend are related to the river in some shape or form” and this has become very apparent the more I talk to people from the area about their special relationship with the Liffey and the Irish Sea. From my findings I will create a sound and/or video work with the hope to exhibit this, as well as showing an archive film of the swimmers at the Half Moon in the 60’s called “MOONMEN” as an installation in one of the changing rooms at the Half Moon Swimming Club on the day of the South Wall Swim. During the winter months it was just myself, Pakie and Barry sea swimming at the Half Moon on the South Wall, watched over by Percy, Billo and Derek who meet at the ‘Man Shed’ on the wall everyday for tea, chats and occasional swimming. But now the summer is nearly here and the rowing boats are all back on the water and the sea swimmers are starting to visit the Half Moon again. The South Wall Swim took place on July 13th 2017. 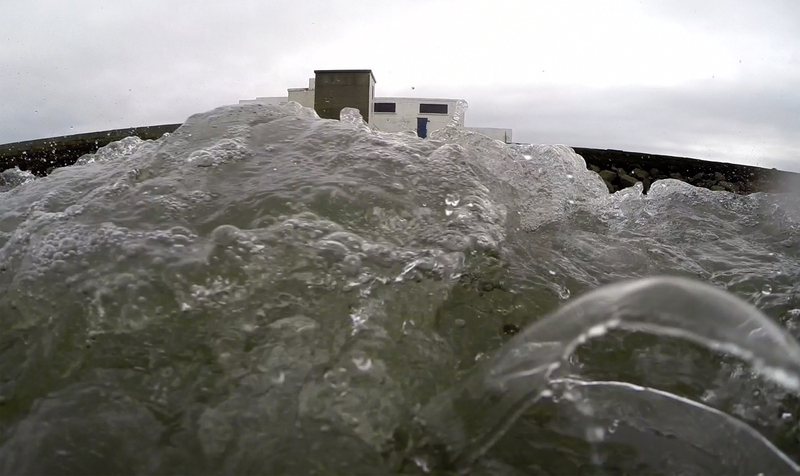 As part of the ‘The South Wall Swim’ there was an audio and film art installation, at the Half Moon Swimming Club on the South Wall. This included my research from talking to swimmers in the Docklands area and the screening of the archive film “The Moon Men” 1965 lent to the project by the Irish Film Institute.